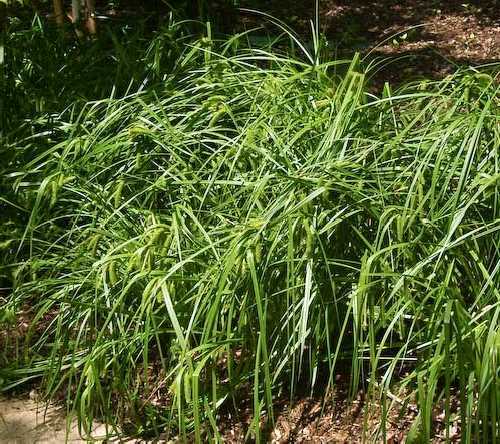 Carex comosa plant. Paul Drobot. Flora of Wisconsin, Consortium of Herbaria. wisflora.herbarium.wisc.edu (Accessed 12/2017). Carex comosa perennial 30-100 cm tall, from a short rhizome, stems tufted, stout, sharply 3-sided, rough along edges near inflorescence. Leaves alternate, blades 0.3-0.9 cm wide, often with small cross veins between secondary veins (use back light), stem leaves sometimes longer than inflorescence, lowest bract large, leafy, little or no sheath, about 1 cm or more wide, upper bracts smaller. Carex comosa.john Hilty.www.illinoiswildflowers.info (Accessed 12/2014). Flowers dry, tiny, monoecious, terminal spike mostly or entirely male, to 6 cm long; female spikes 2-7, cylindrical, 2.5-7.5 cm long, 1.3-1.7 cm wide, nodding on slender stalks, densely flowered, sometimes prickly from sharp perigynia teeth, perigynia 0.5-0.7 cm long, (beak about half of length), pointing somewhat outward, beak teeth curved outward, stiff, sharp, about 0.1 cm long, scales, very narrow, long-awned about as long as perigynia, persistent after perigynia fall; blooms and fruits June-Sept. Frequency in NYC: Very infrequent (May now be extinct). 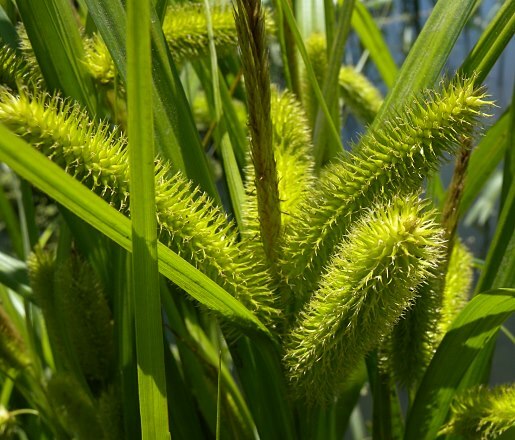 Habitat: Open marshes, pond edges, soil pH 4.8-6, tolerant of anaerobic soil and fire, moderately tolerant of shade, intolerant of salt and drought (USDA, NRCS 2010). Notes: Possibly planted wetland in seed mixes.